of a modified truck that was decorated in party colours. hot tea and little chats on the way; near a decades-old cinema theatre Congress workers surrounded their car. decades, the party managed to generate a buzz in UP, that too in its capital, which has voted the BJP in every election since 1991.
on corruption. The chant, picked up by the workers, followed them for much of the journey. kaleidoscope of posters and billboards lining the roads were those featuring her grandmother Indira Gandhi, playing on her striking resemblance to the former prime minister. 2014 national election, winning 73 of 80 seats. Her older brother announced her political debut as the party’s general secretary in-charge of eastern Uttar Pradesh two weeks ago. Jyotiraditya Scindia will be in charge of the other half of the state. party’s Shakti App on Sunday. The roadshow took a 20 km route through some of the most congested areas of the city. charge of. 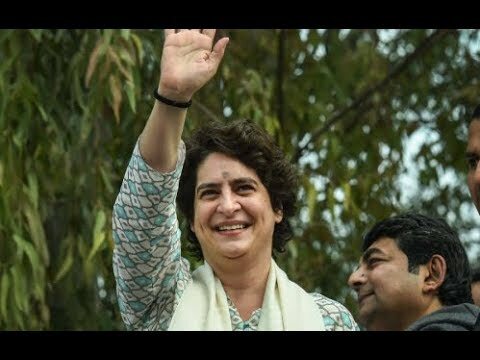 Congress sources say after Lucknow, she may tour eastern Uttar Pradesh before returning to Delhi. relevance but for a “vote-cutting” impact on other parties. dropped by almost 50 per cent between 2009 and 2014.